Macklemore's "Thrift Shop" tops Billboard Hot 100. According to TIME, the rapper’s “Thrift Shop” is the first indie hit to top the Billboard Hot 100 in nearly 20 years. The achievement marks only the second time that an indie hit has done so. TIME notes that Macklemore and Ryan Lewis join folk-pop singer Lisa Loeb as the only artists to top the charts without a label. Despite the success of “Thrift Shop,” Macklemore recently admitted that he never expected the single to become so popular. Macklemore thinks that the secret to the song’s success comes from its non-traditional lyrics. Instead of rapping about a pricey car, Macklemore raps about bargain shopping and looking cool at the same time. This comes as the rapper recently proposed to his girlfriend Trisha Davis. “After 7 years… I asked. And she said yes. The love of my life,” he tweeted along with a photo of the ring. 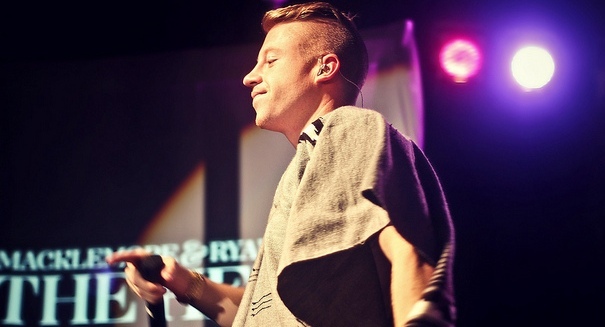 Macklemore performed with producer Ryan Lewis on their Heist World Tour live at Sundance 2013 on Friday. “Thank you Park City Utah!!! Crazy night! Huge shout out to my dude@TalibKweli for coming up and KILLING it!!! #sundance,” Macklemore tweeted. Have you heard Macklemore’s “Thrift Shop?” What do you think of it? Will this be Macklemore’s only appearance on the Billboard Hot 100? Share your thoughts in the comments section.